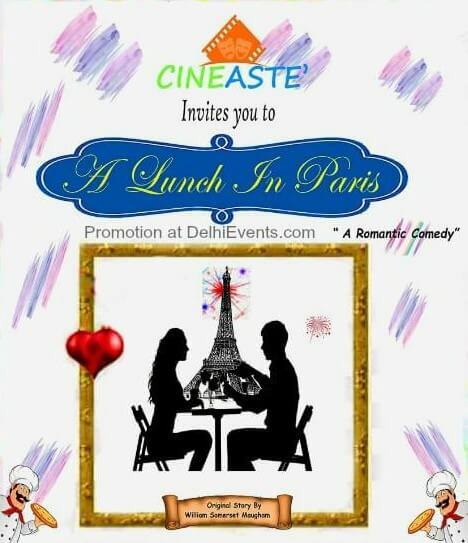 Event Description : THEATRE : Cineaste presents "A Lunch in Paris" Hindi Comedy Play. Synopsis: Adapted from a short story written by William Somerset Maugham the play is about a middle-class writer in Paris and his admirer - a woman. She wants to meet him for a lunch. He accepts the proposal but is shocked to see that she is a much older woman & had picked an expensive restaurant. The icing on the cake is, he only has few francs to survive for the month! She starts ordering expensive dishes one after another which leaves him broke. But then he gets his revenge at last! The narrative style is embedded in irony with a touch of delightful humor.